Seems to be like that. If you put the ungrouped files into a subdir and load it with custom content dir function, everything works fine (also if you zip everything). Super-solid work. I have never played RR, and normally I would always experience the original first, but since MetHy said that this really is faithful but much more convenient, I figured I might as well use the port. So far especially the game's textures and authentic map themes have impressed me a lot, and with eDuke controls it's just a ton of fun, even when just trying to figure out how to get ahead in the map. I think i figured it out. Try to set "flags" field in grpinfo to "GAMEFLAG_RR", otherwise it would default it to Duke 3d. Does anybody have an easy way to convert "redneck.gog" into an iso to extract the audio? Redneck Rampage without the music isn't half as fun for me. Or can you tell me the track names. I downloaded the soundtrack from GoG and converted it to Ogg. It should be track02-track09. It just doesn't play the title music (track02) in the menu for some reason. I can live without the menu music. The Rides Again Soundtrack has 9 tracks. I assume I name them track01 to track09? No, track01 would always be the data portion of the CD afaik. Music always starts with track02. I dunno what the original game did with track10, but it seems it's a bonus track and not really relevant for your ingame experience. I could be wrong, though. Yeah, I think it would have made sense had it played at the start of Wako though. name       "Suckin' Grits on Route 66"
"Size" and "crc" are from the custom-made route66.grp (which can be compiled from the GOG version according to this guide, but I think you don't have to rename the maps since user66.con already uses the right names) while the "dependency" value is the CRC of redneck.grp. 1) Create two zipfiles with the ogg tracks inside, named track02-track09.ogg (Redneck Rampage) and track02-track10.ogg (Rides Again). Rename file endings from .zip to .dat (e.g. redneck_music.dat and rides_music.dat). 2) [OPTIONAL] Put both .dat files into a subdir called "music".
. If you didn't put the files into the music subdir, omit the "music/" part. name       "Redneck Rampage: Rides Again"
Please note that Route 66 groupfile needs to be created manually as pointed out above. You could also just drop the music files into the autoload dir, but my method has the advantage that both music packs can stay in the same place without one overriding the other. This way you won't need to switch music packs depending on whether you want to play RR/R66 or RRRA. Nice to hear it. And thanks for your suggested soundtrack approach. BTW, in order to hear track10.ogg ingame you have to type RDGARY cheat. It seems I found a little bug. When you are in the settings and a demo plays in the background (i.e. you are not playing the game) the interface gets messed up at the end of the demo. The interface is shifted, so that you see half of the previous menu and half of the actual menu. It wasn't possible to navigate properly anymore, though hitting escape helped me out of it. I played on HD (1920*1080) and had the Polymost renderer enabled (but it may be that it happens on Polymer too). I think it's already fixed in my repository. I'll upload new build soon. Rednukem is seems to be quite solid now, so i bumped version up to 1.0. Wow, that happened fast! Any plans already where to go from here, like additional features e.g. highlighted/colored keys and some sort of marking switches? These are two elements that make the game quite hard and frustrating, and tbh I'd always play with these settings enabled, provided they were available/implemented. .... like additional features e.g. highlighted/colored keys and some sort of marking switches? These are two elements that make the game quite hard and frustrating, and tbh I'd always play with these settings enabled, provided they were available/implemented. That is an awesome idea. I really like the Redneck Rampage theme .... but I never played through it because of these frustrating elements. They don't enhance the gameplay ... I want to play a shooter ... if I want to search for something I look for my car's keys for hours. I did the same with Twin Dragon (using maps without the bugged mines in the redux version), the original WOlfenstein 3D (I made my own set of maps to condense the story), etc ... so making highlighted keys and switches for RR would be really great. I would like to say that this is the project I have been waiting for a long time. 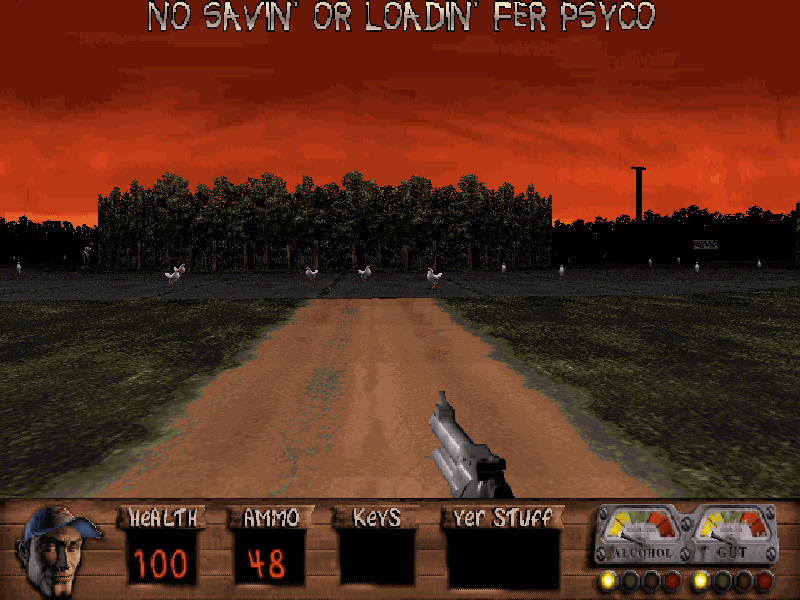 Redneck Rampage was always a deeply flawed game - the level design was uninteresting or confusing (yeah, those keys), weapons felt wrong (the only one that was so so was the machine gun) and enemies were wildly unbalanced. You know how tough the dogs are, for example. But this source port open new ways to modifications as you can fix most of those issues. You won't fix bad level design of the original game but you can always play the expansion or the sequel. That said, weapon mod is something I would like to do in the future. Something that will be as vanilla as possible but more fun. There not that many BUILD games to leave RR as is. An improvement I'd like to see is having the enemy counter fixed. NukeyT told me lot's of things that shouldn't count as enemies do (like tornados, or even Bubba) and Vixen only count as dead if their bodies are gibbed, which should only be the case for Hulk Guards. Also if mods start being made, making sure that chickens and cows don't attract auto aim and have proper hitscan would be nice. Dead cows creating an invisible wall blocking bullets above their corpse is really bad. I noticed a difference in this port that confused me for a bit as I wasn't familiar with the original game's behavior. While playing in Psychobilly difficulty, I tried pressing the quick save button, but nothing happened. No message, no indication saving had failed, etc. I eventually surmised from the blue'd names in the main menu that saving was disabled in the highest difficulty, but the original DOS version actually provides a specific message to the player stating this limitation if they try to save. This message doesn't seem to appear at all in Rednukem. Your Version 1.0 have some Hit Bugs from the AI/KI , it tooks longer til Die in Rednukem , look in Compare to Erampage much faster ! And the Colour Correction , must every set at Gamestart , in the Video you can't see this , because OBS Studio have use a own Gamma Set ! But i know , M210 had too some problems with the own Hit Distance , but that is fixed with your Rednukem and like in Erampage now , but i think the orginal RR is very complicated for a Port ! Anything ERampage does but Rednukem doesn't is wrong. You sure that is Normal so ? Thats but very Easy then on KillBilly Dif. , in Erampage looks this more like the Killbilly Dif. But i have use Erampage in compare , because M210's GDX Version have an Hit Distance Bug , in Erampage is this not , and in Rednukem is it like in Eramapge , also like in the Original Game ! Not all is wrong in Erampage ,sure it have bugs , and some is Missing ! ERampage is a hack imitation. Delete it from your hard drives. you can recommend that, but I doubt you can authoritatively dictate it as a command to be obeyed blindly without question. Chances are, if someone has it, they're going to ignore you. They're probably going to keep posting about it as well. Just so you know. Use of the imperative voice doesn't necessarily imply that it is an order. It is also used for instruction, for recommendation, etc. You can't use Erampage as a comparison for accuracy given that Erampage was never accurate to begin with. This reminds me of when byuu made bzsnes as an april fool's joke. Why didn't you compare this behavior against original DOS EXE? I've checked it and both Rednukem and original DOS EXE behave the same. ok , You did Test with Dosbox 0.74 or 0.74-2 or with SVN Version ? I use GOG version. Not sure which version of DOSBox it uses though. Open the Dosbox.CONF file. It should be the first line.